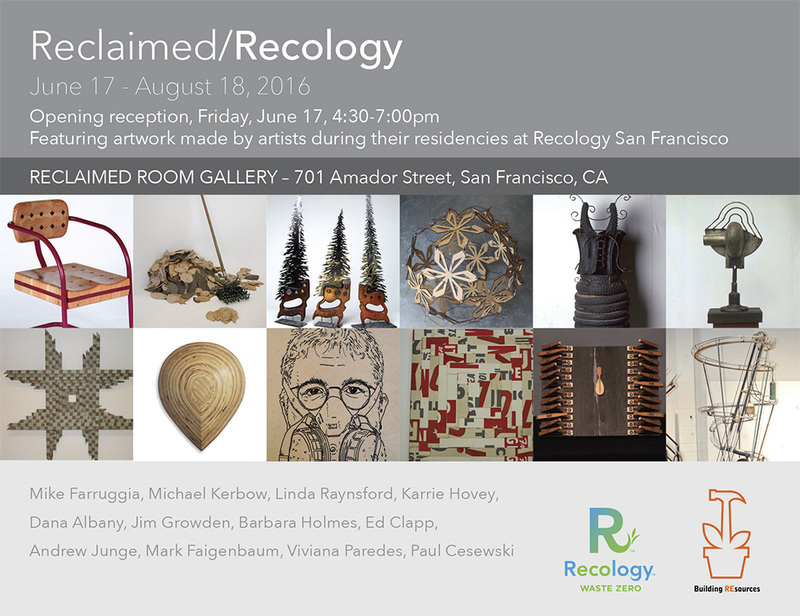 For our next show we have teamed up with the Recology Artist in Residence program and will feature works from a dozen local artists who participated as residents. The lineup of artists as it reads on the postcard is Mike Farruggia (’05), Michael Kerbow (’04), Linda Raynsford (’00), Karrie Hovey (’12), Dana Albany (’03), Jim Growden (’91), Barbara Holmes (’08), Ed Clapp (’06), Andrew Junge (’05), Mark Feigenbaum (’05), Viviana Paredes (’05) and Paul Cesewski (’08). During their residency, each artist was granted scavenging rights in “the dump” and had 24 hour access to the company’s well equipped art studio. Our exhibition will have one or more pieces from each artist and will be shown through August 18th. The opening reception will be held Friday, June 17th from 4:30-7pm.